After many difficulties, you’ve mastered those English conditionals — you know, the “if” sentences. You can use them effortlessly in context. Without thinking. Because you rock at English! Wha….? What did he just say? Wasn’t that a question? Was he asking if Shelly should arrive on Thursday or not? But you don’t know who Shelly is, so how would you know when she should arrive? Also, this didn’t sound like a question. OK. So, welcome to the weird world of advanced conditional sentences! There are three ways that we can play with conditionals that expert English speakers use effortlessly. So this is your chance to sound super smart. We’re going to look at these three tricks over the next three lessons. Today, we’re going to deal with mixed conditionals. This topic was actually requested by one of our readers. So if you’re reading, Irina, great idea and thanks for suggesting it. But before we mix the conditionals, let’s revise how they work. If it rains tomorrow, I’ll stay in and watch giraffe documentaries. We have the “if” part, which sets up the situation, and the other part, which describes the result. This is an example of the first conditional. We use it to talk about likely situations in the future. 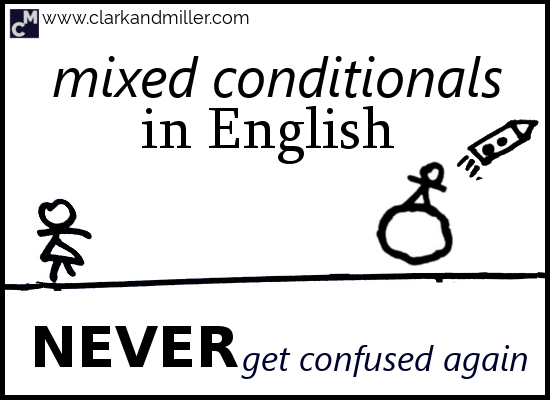 Because we don’t use the first conditional in mixed conditionals, today’s post is going to be focused on the second and third conditionals. These are the conditionals used for hypothetical (unreal) situations. Let’s look at how they work. If I had more money, I’d totally buy that giraffe. If I won the lottery, I’d go to Pisa. Because it’s awesome! If I had listened to my mother when I was a kid, I would’ve become a cosmonaut. OK. So those are the unreal conditionals in English. No problem, right? We create an unreal situation and describe what effects it produces. As you can see, with the second conditional, we create an unreal general situation and describe an unreal general (or future) effect. And with the third conditional, we create an unreal past situation and describe an unreal past effect. But what if you want to create an unreal past situation and describe an unreal general (or future) effect? Or what if you want to create an unreal general situation and describe an unreal past effect? If we had the key, we would’ve gone in. If we’d picked up the key, we’d go in. If I had listened to my mother when I was a kid, I would be on the moon now. If it wasn’t winter, I would’ve walked home. OK. So now you can master the unreal! These mixed conditionals are often about regret — about something that you wanted to happen that would make life better now. But they can also be used positively! So, let’s finish on a positive note. Think about your life now. Choose something positive about it. How did it happen? What was the past event that caused it? Tell me, in one mixed conditional sentence, how your life would be different now without this past event. Did you find this useful? Do you know any people (or giraffes) that might also benefit from this? Then BE AWESOME AND SHARE! Please spread the knowledge! If I hadn’t met you,I wouldn’t receive so useful and interesting material .Thanks a lot ,Gabriel. Wow — what an awesome first comment! Thanks Sevil. The mixed conditional here is absolutely perfect — good work! How is the mixed conditionals type 1 and 3 used in the examples? This is a great question, Faelan. Thanks! Generally speaking we can’t mix the first and third conditionals as they’re both on other sides of that “reality/hypothetical” line. So we can talk about reality either generally: “If she knows the answer, she tells him.” (Speaking about an active student in class, for example). It’s not technically correct, but it’s quite common. If I hadn’t read your article about mixed conditionals yesterday,I wouldn’t know how to use them now. Wow! That’s exactly what I’ve been waiting for ? Such a brilliant work! Thank you so much!! No problems Irina — thanks for the suggestion! It would be great, If I had understood this topic when I was at the University. If I hadn’t had Internet, I wouldn’t be able learning English in a such interesting way. Thank you very much? Gabriel! Thank you for a different perspective on mixed conditionals. It looks clear and easy to understand. I’m glad you found it useful Helena. Thanks for the positive feedback! Luckily I know all these things because I’ve been teaching my students to use them correctly. Allthesame, thank you for drawing our attention to them – theymake our communication richer, even refined to some exent! Good work Olga. They’re often overlooked. And thanks for the positive comment. You rock! If I won the lottery, I’d become a lottery winner, obviously. But if I were a modern-day Gambling Hansel, I might beg three favours and terrify all casino owners. And who knows, even be the richest man of all time… if I was still alive. If Howard Wolowitz listened to his single mother, he would’ve never become an ex-astronaut! And been dubbed ‘Froot Loops’. If we had the master key, we could go in pretty much whatever tickled our fancy. If it wasn’t wintering and very heavy snowballs falling, I should’ve stopped drinking and walked home. If not for you, Gabriel, I would be stuck in a rut. My favourite’s the last one. Funny, impressively written and flattering! The magic combination! PS. If you replace “if only” with “I wish” in your head, then the sentence might be a bit less confusing. “If only” isn’t really a conditional. If i hadn’t liked playing video game so much,i would be one of the best students in school now. If I had been born in Japan, not so many people would have criticized me for being so addictive to Japanese animation. Hmmm… Not completely clear there, Jack. Do you mean you would do the searching now? If i hadn’t like playing video games so much,i would be one of the best students in school now. If I had studied at school, I would go to the cinema with my family. Hmmmm…. do you mean if you had finished studying at school? I mean I’m still at school. I didn’t read carefully and understand it much. But when I read it carefully again, I realised the important of it. Now I can make a lot of better sentences. This is one of my favorite: If I recieved one of my favorite shoes on the internet, I would keep it in a secret box, hide it under my bed and I do not thing with it, just see it and send it on its place. If I had studied hard, I would do better at my Math exam. I wouldn’t get such positive comments on my book if I hadn’t written it with all my heart. Also, well done for writing a book! Great grammar, Jacob. You nailed the mixed conditional. I wouldn’t understand this subject if I hadn’t seen your sentences.! But whst about using unless ,can you teach it too , please ??!! Amazing! If I hadn’t read this, I wouldn’t know about mixed conditionals.